(Barcelona, 1970). A Fine Art graduate. After working for 12 years in advertising, she once again took up brushes and pencils to paint murals for children, and later on, illustrated albums. 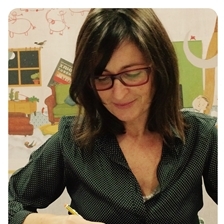 Today she has illustrated more than 40 titles, and is author of 6 of these, including ¿De qué color es un beso?, Max y los superhéroes and ¡Hermanos!, which have won a number of prizes and have been translated in more than 15 countries.